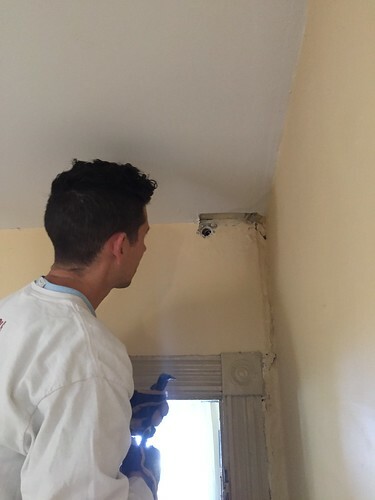 Who would have thought the 1990s hip hop party anthem "Jump Around" would eventually serve double duty as the theme of how I attack renovation projects? 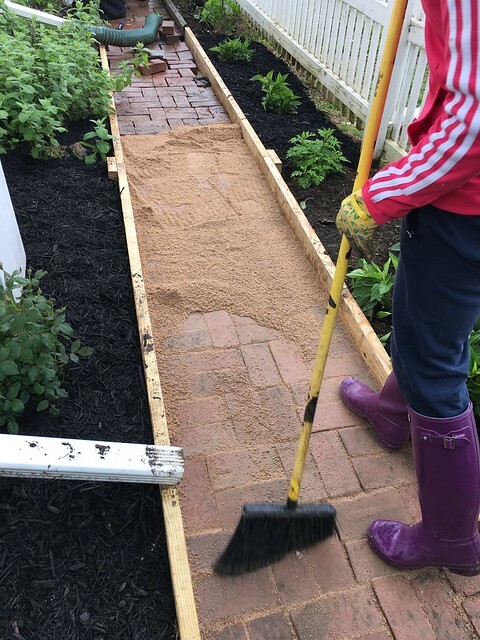 Everlast, DJ Lethal, and Danny Boy May never have intended for a 30 something DIY enthusiast to hang this catchy tune on her approach to home projects, but it happened, and it's all thanks to my mounting impatience and desire to just get something completed. 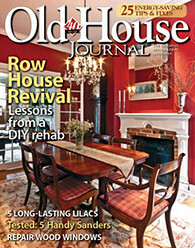 For anyone who is following our renovation journey spanning more than a decade, we thank you. Due to a limited availability of time, a desire to do things ourselves, and a tendency to prioritize "doing it right" over "doing it quickly," we move at a snail's pace when it comes to home improvement projects. What's worse is the simple fact that when we're starting to make progress on a large project, I'm frequently guilty of making us shift gears due to my impatience. Yes, yes, I'm fully admitting to being the catalyst for so many side projects taking over primary projects and massively derailing timelines. I often blame Alex for the slowdown, but it's at least partly on me. Let's call it "Wendy's Law." As a result, I'm sure when reading along it's hard to follow our progress, and can say that as someone living through the process, it can even be confusing for me. The point of all of this is to tell you, in true "Wendy's Law" form, I've gone and thrown a wrench in our DIY plans. ...the mounting impatience of my project demons have gone and done a bad thing. I decided it was time to fix up the office. 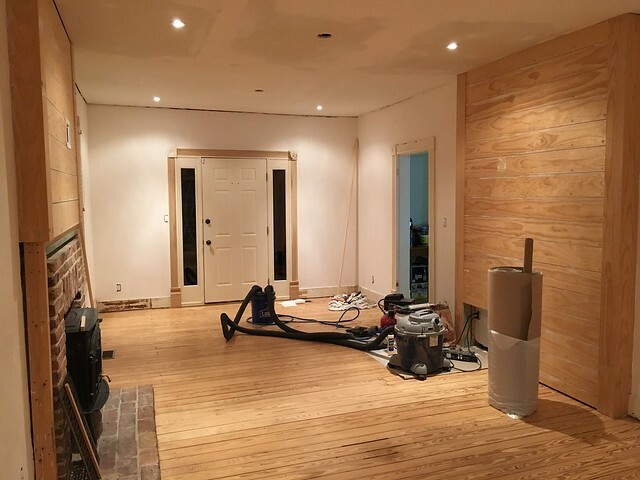 The challenge for me lies in the portion of our project timelines when Alex is involved in detailed finish work or woodworking steps that are more or less a one person undertaking. During these times I find myself focusing on the things about the house, a room, or the yard that drive me crazy. And I then convince myself that it's time to start something new, as it will be a quick fix, make a huge impact, and won't really slow us down on all the projects already underway since I can just work on it without involving Alex. This is actually how our small downstairs full bath actually started earlier this year. In our foursquare there's a room we call "the office," mostly because the former owner used it as such (not because we use it as one). 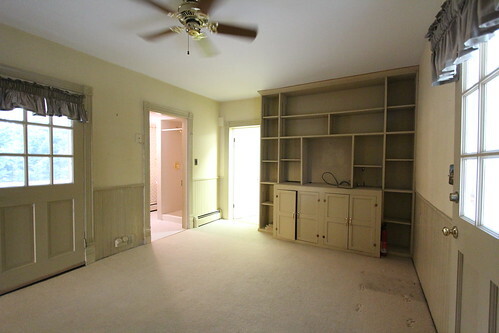 Here's a look at the room before we bought the home to give you a sense of the room and layout. While we call it the office, we use it primarily as a dumping ground. It's the room we use to enter and exit the home via the covered side porch entrance, as well as a spot to greet arriving guests. It's also where we tend to plunk down our tools and supplies each time we arrive, and often where they sit until we gather them up to leave. Here's a look back at the room right after we closed on the house. The room has a challenging layout. It not only has five doorways (and no windows) with entry/exit points to the utility and laundry rooms, the downstairs full bath, the front porch, the kitchen, and the wraparound porch were we have our outdoor dining table, but it is also home to the back staircase which leads upstairs to the back portion of the home. As you can maybe tell from the photos, furniture layout has been a challenge. As we've mentioned previously, our house was originally built as a hotel, and the office, utility room, laundry room, and rooms above it were part of the "service wing" where the family who ran the hotel lived. As a result, it's a bit of a strange, disjointed section of the home that feels separate in many ways. This layout makes furniture placement difficult at best, but it also has some other less than desirable features. I'm not one to turn away an offer of help when our project list feels 18 million miles long, so Alex and I started talking about where they might be able to pitch in to move things along. Most of the rooms in the house will require extensive plaster work, electrical, etc. before painting can commence, but the office is in decent shape all things considered, and won't be renovated more completely for quite some time. After talking it over, we decided that after a little bit of prep work on our end, a lot time and effort repainting (thanks Mom and Dad! ), and new carpeting, I think we can dramatically transform the room to be a much more welcoming space. And so the jumping around began late one night after we arrived at the house. While Alex worked on the built in bench project, I started clearing out the room so we could work. 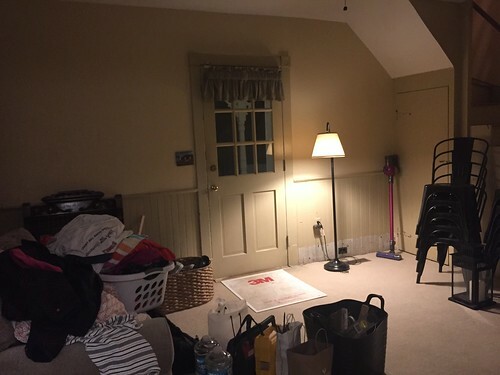 What didn't seem like "much stuff" to start out with, quickly became a knee numbing number of trips up and down the back staircase to relocate everything to the room above. 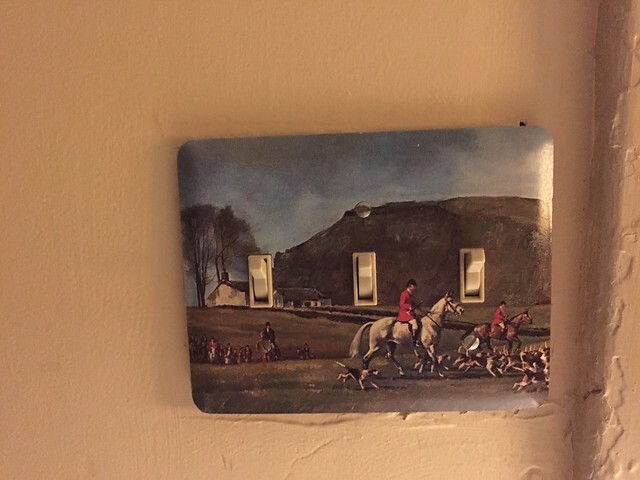 and removed all outlet and switch plate covers, including this lovely painted horse scene. 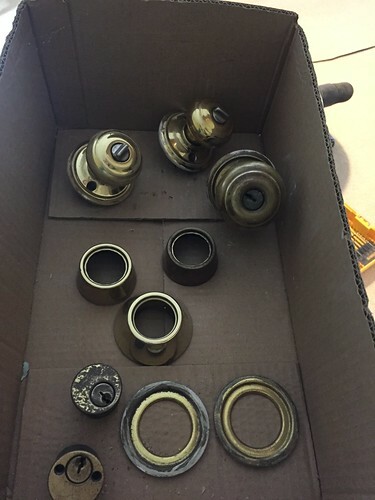 Off came the cabinet hardware and the closet door, and the knobs and door hardware, which were earmarked for a quick spray coat of oil rubbed bronze paint. 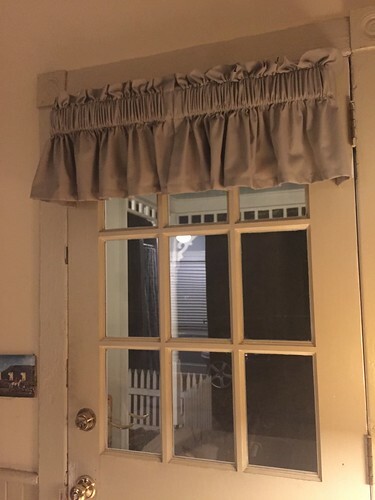 While not a permanent solution (and it will chip and scratch if we're not careful), it's a quick and inexpensive solution to dress up hardware without making a significant investment. I worked away that night and while I promised to head up the effort, I couldn't help but pull Alex into my distraction project vortex by the next morning. 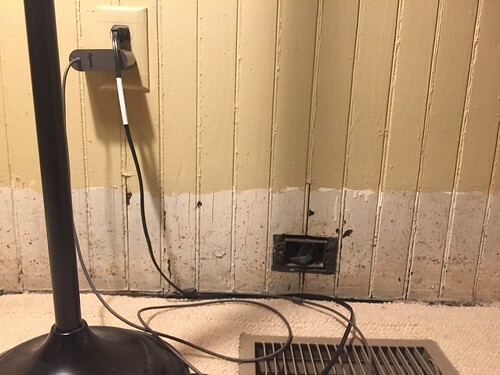 Remember that "little bit of prep" to fix up the room? Well, the light of day and careful inspection highlighted a few eyesores that we decided we needed to address (and many that we're going to live with). 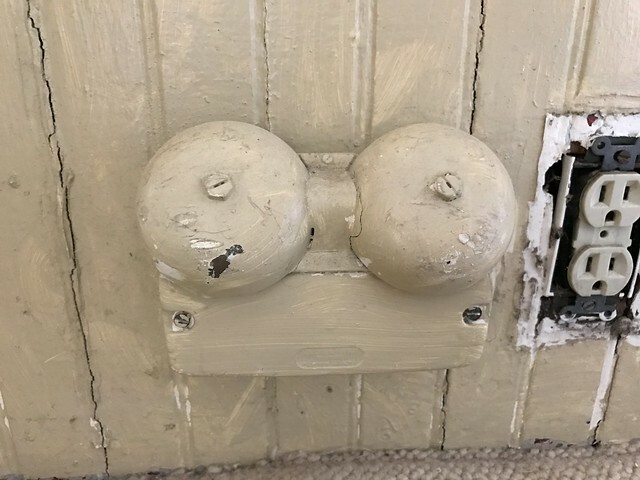 Like the old phone jack hanging on the wall and these inoperable bells (which we assume were once connected to a phone line). 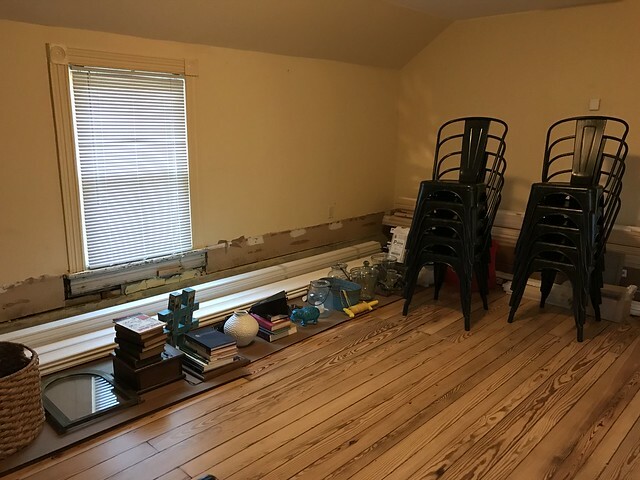 ...and worst of all, the damage left behind to walls and the ceiling when the old burst pipes were removed in anticipation of the new HVAC and plumbing lines. So, we both spent the day patching and correcting the nail holes, divots, and other oddities of the room. Many of the most glaring problems required some creative drywall patches and a quick coat of joint compound or two. One thing we've noticed about this whole house is that no one at any time in any of the renovations seems to have believed in wood filling nail holes. 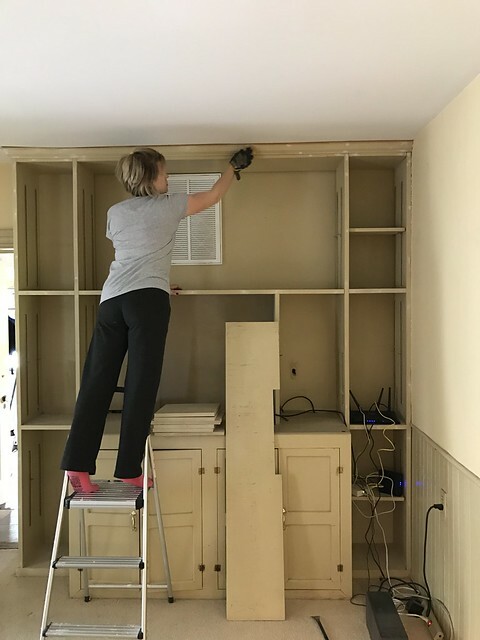 It doesn't matter if we're talking about the original baseboard mouldings or door casings, or the newish builtin cabinets from the 1990s, we have a whole lot of nail holes to fill and sand. 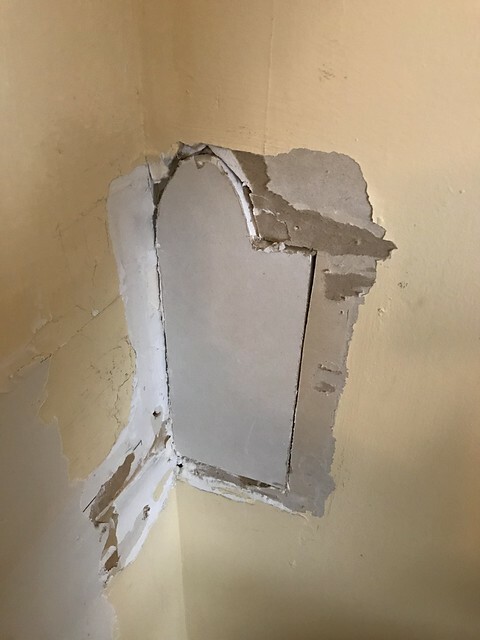 There were many little issues we were resolving in this room, but one of the worst ones I had to convince Alex to make a solid attempt at correcting was this extremely lumpy and bumpy area of plaster next to the doorway into the kitchen. At first I know it pained Alex to just quickly smooth this out, but we needed to correct this unsightly mess or it's all we would see once the room was fully painted. 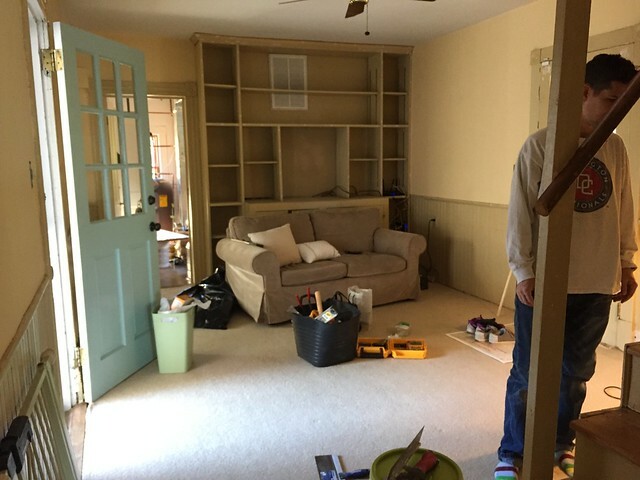 With room fixes all well underway, let's take a look at what we plan to accomplish in this room. So what are the plans for this space? Now that the day and a half of prep work is behind us, the fun work can begin. Paint Walls, Trim, and Doors: We'll coat everything with a high quality primer, and then will be painting the built in shelves, bead board, trim, doors, and molding in Benjamin Moore's White Dove (the color we've selected for all throughout the house.) The walls will get a coat of Sherwin Williams' Agreeable Gray, a soft, warm gray that we also plan to use throughout much of the home. New Carpet: While we wrestled with this one (and by that I mean Alex wanted to keep the existing carpet or rip everything out and refinish the hardwood floors beneath the rug), I want to go a more middle of the road approach. I don't want this project to be help up by a month or more of working on flooring, but on the other hand the current carpet is stained in too many places to count, and doesn't extend to the wall where the old baseboard radiators were located. So I've set up appointments to get estimates from a couple places to see if we can find an affordable carpet option. 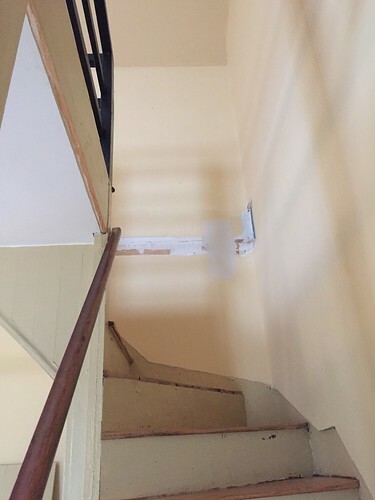 Replace Handrail: We struggled with this one too. 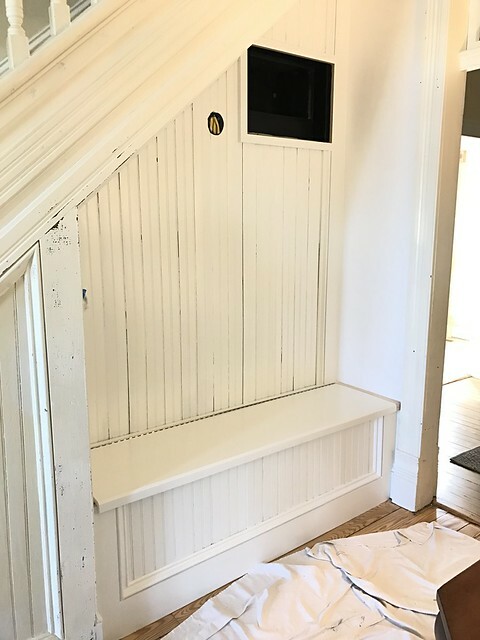 We believe that originally the tongue and groove pine went all the way to the ceiling and was cut off to the stair height by a previous owner. A 2x4 was then installed and the handrail applied. Eventually we'd like to return it to the original configuration, but I also hate the look of it currently and don't think the current set up is a particularly safe one. So we'll be looking at building a better option. Decorate! : Ahh, the fun part. We'll be shuffling around some furniture and accessories from other parts of the house as well as searching for a few new additions. The plan is to relocate the tan couch to the attic and move a desk from our front guest room to put in front of the shelves facing into the room. 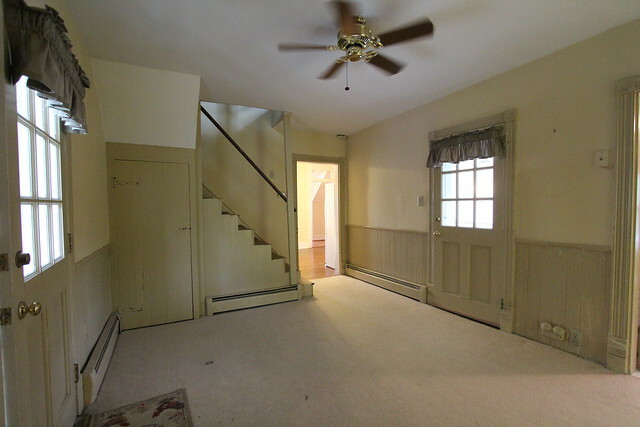 I'd also like to get a small chair or two to put in front of the stairs with a small table or lamp. We'll be able to work from the desk when we're at the house, and desk will also provide a surface on which to set things as we come in. Overall I envision a brighter space that will feel clean, bright, and welcoming when you walk into the home. As with most "quick fixes," I'm sure this will take longer and cost more than I thought at the onset. But mentally, I need this. I've been stuck in a rut, feeling really down about our lack of progress and lack of finished spaces in the house. It's been more than two years since we purchased the house, and while we experienced a setback de to the HVAC replacement last year, I was feeling overwhelmed and a little discouraged. So far we've really only been able to show people the small downstairs bathroom as an example of what we think the whole house will look like eventually. While I continue to embrace my personal DIY theme song, "Jump Around," the irony isn't lost on me that the name of the artists who created this beautiful ballad to starting projects completely out of order is House of Pain. It's time to have some fun and put together a space I can feel good about (and in). Thanks, Anna! And Happy Friday to you too! Looks like a fun "quick" project - HAH! Is this in any way a contender to be a mudroom??? Seems like it has outdoor entrances (several!) I ask because any water front house is going to have it's share of outdoor related activities. And you could just tile the floor with slate or something like that instead of carpeting. And you could still have a desk in there. Just a thought!! I tried to figure out the configuration so not sure if the location lends itself to a mudroom. Hah is right, Melissa!! 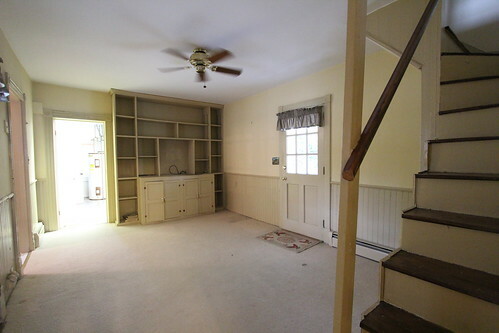 Given how we use the space, turning it into a mudroom would make the most sense. That way people could take off muddy shoes, drop and store items upon arrival, etc. But this room feels a little too large and a little too "visible" to be a mudroom, we'd probably have to pull out the built ins to make room for storage, and the floor isn't property supported for the weight of tile. (sigh) Eventually I think we'll turn a section of the adjacent laundry room or utility room into a space that can better serve those needs. Finally just went back and looked at your response! Take another look at peal and stick linoleum. We just used it in our condo bathroom in Florida and I'm ready to use it in the entire condo!! I LOVE it. And it's super lightweight. Then you could be prepared for the muddy boots no matter what! Thanks for the feedback. I know I've been a little quiet on updates this year, and I need to be better about documenting and sharing some of the items I work on behind the scenes! 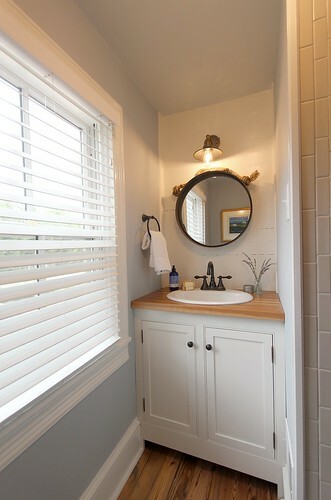 I am in love with the sink, mirror, light, and shiplap in your downstairs bathroom! I love these types of projects best. Inspiration strikes so you strike. It's amazing the amount of work you can conjure in dark forgotten corners. I don't know that name of the room- but I think there is a period specific name for the entry rooms with round tables and library shelves and perhaps baskets of garden vegetables- and definitely bouquets of seasonal flowers.. A large luxurious landing for all things that enter the house. I think this room is large enough and in the right location for such a task. 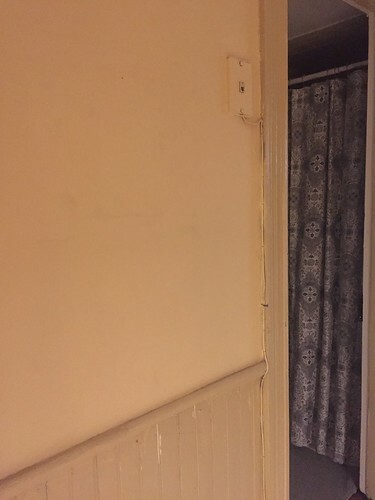 At any rate- have fun dreaming up a use for this space. It's the carrot in front of those pesky punch-lists. You've painted a lovely picture for me, Mary! That sounds so wonderfully inviting! what width is ur ship lap ? 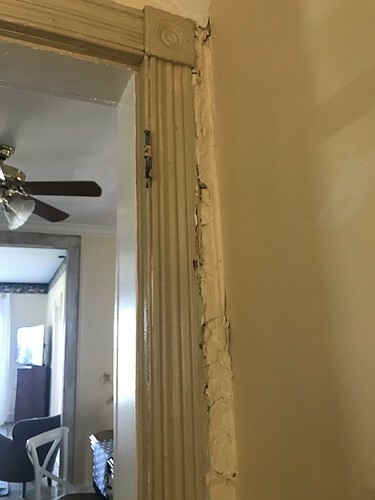 And what width molding did u used ? Hi Dana. Do you mean the ship lap in the bathroom or are you referring to the bead board in this room (the office)? Both of these are original to the house (we didn't install them -- just working on restoring them). The width of trim and moulding depends on a lot of things, including style of the molding, style and age of your home, etc. If you provide some additional detail I might be able to share my two cents. Thanks, and I hope your project is going well! I'm not finished reading the entry, but the photo of "the room above" reminded me just how glorious your refinished floors are. Wow. They are mind bogglingly beautiful! Thanks so much, Whitney! We're really happy with how they turned out too! I love that you guys do everything "the right way". I feel like a lot of bloggers would just shoot around that bumpy plaster. Have you shared the floor plan of this house? It's hard to envision how these rooms all connect! Thank you so much, Em. We really appreciate you saying that. We have a floor plan on the house in development and look forward to sharing it. It's definitely hard to envision how everything connects from the photos (and even sometimes in person for first time visitors). Coming soon! Slow and steady wins the race. I'm glad I stumbled across your post. Bathroom looks terrific for sure. I'll have to check back to see the rest of the house done. If you want to check out our blog at http://www.villasgaragedooraurora.com we have some DIY stuff for homeowners and their door projects. I think you are not slow at all. Everything you have done so far looks amazing. Thank for this inspiring update. I've been having fun reading your posts and commiserating with your past endeavors.. and then I saw where you'd written "Forget whether you're a fan of the color or not..." and had to laugh out loud.. I AM! Wonderful work all around.. and no doubt those color choices came with the territory? 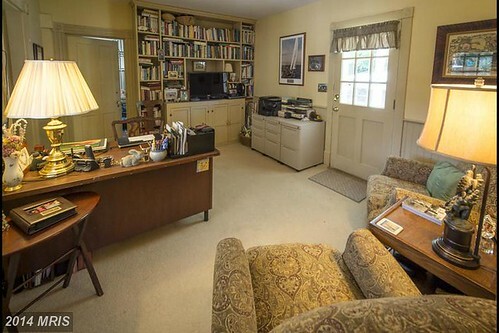 But I'd still love to know what the wall and especially the moulding color was in the 'office'. The is it grey is it green is it neutral mix is so timeless. Just beautiful. Many thanks.